With the current growth in cloud infrastructure, a lot of focus is being given to cloud provisioning and monitoring technologies. But this doesn't mean that service management is relegated to the back-burner. 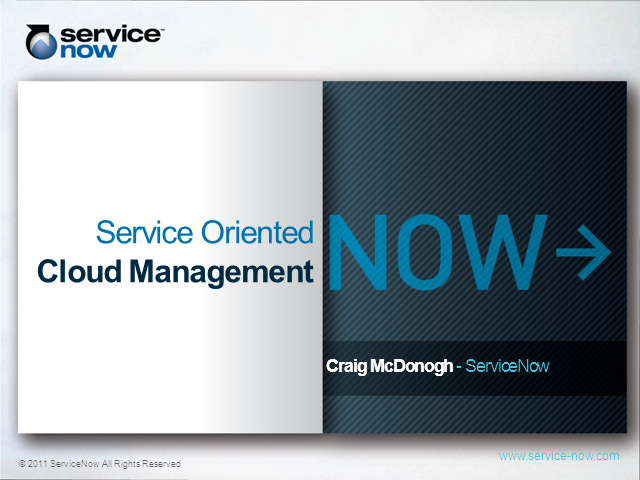 In fact, Service Management becomes even more critical in a cloud environment. Providing services to the business is still the ultimate goal, the cloud simply provides an environment delivering on-demand self service, better availability, lower cost and broader client access. Join Craig McDonogh from ServiceNow to hear about the variety of cloud options available and deployed today, why ITSM is often the best first step into cloud, how to maintain control of your technology as you transition to the cloud, and how to use a combination of service management and cloud infrastructure to deliver business services better, faster and at lower cost.